On 9 January, AVO reported that unrest at Iliamna had decreased over the past several months, reaching background levels. The Volcano Alert Level was lowered to Normal and the Aviation Color Code was lowered to Green. The report also noted that occasional small earthquakes had continued, but at a greatly reduced rate and magnitude relative to the peak of unrest in March 2012. Steam and sulfur gas emissions continued to be observed from sites near the summit during periods of favorable meteorological conditions, not unusual at Iliamna. Iliamna was last discussed in September 1997 (BGVN 22:09). This report is largely based on seismic data extracted from Alaska Volcano Observatory (AVO) yearly reports for 1997 to 2011, with the exception of an increase of seismicity during early 2012 that was reported by various sources. From the start of 2012, both rockfalls and seismicity progressively increased; this prompted AVO to increase the Alert Level to Advisory in March 2012. A map showing the location of Iliamna in relation to nearby volcanoes and communities is depicted in figure 1. Figures 2 and 3 are topographic maps showing Iliamna's known debris avalanches and rockfall deposits. Figure 1. Map of Iliamna and nearby volcanoes and communities. Iliamna is in SW Alaska near the mouth of the Cook Inlet, and W of the Kenai Peninsula. Courtesy of AVO. Figure 2. Iliamna topographic mapping of known debris-avalanche and rockfall deposits. As indicated in the explanation (bottom), red triangles indicate debris avalanches associated with Iliamna, pale orange triangles indicate debris avalanches associated with Iliamna that have been reworked by glaciers, green triangles indicate debris avalanches not associated with Iliamna, green and red dashed lines indicate the maximum likely extent of debris avalanches with relatively long and short runouts, respectively, potential pathways of debris avalanches are indicated by red arrows, and orange shaded areas indicate the generalized extent of rockfall debris on glacier surfaces. Courtesy of Waythomas (1999). Figure 3. View of the SE flank of Iliamna Volcano showing debris-avalanche deposits from 1997 (solid red line), the fumarole zone near the summit (yellow dashed line), and the older avalanche scar at the head of Red Glacier (red dashed line). Photo undated; courtesy of Waythomas (1999). Most of the upper edifice exposes highly altered, unstable rock and shows scars from mass wasting. The E scar has been the source of frequent non-volcanic gravitational collapses producing mixed avalanches of ice, snow, rock, and mud that typically extend several kilometers downslope. Some are large enough to be visible from the Kenai Peninsula (Neal and others, 1995; McGimsey and Wallace, 1999). Reports on Iliamna's seismicity since early 1997 are sparse. According to AVO, a pilot reported a fresh deposit of mud and rock on the upper NE flank on 6 July 1999. However, spring and summer avalanches are common on the glacier-dominated summit. On 25 July 2003, an avalanche of snow, ice, and rock occurred. The event lasted four minutes and was recorded by seismometers located 75 km away on Augustine volcano. The avalanche presumably originated from the same vicinity as in previous years, a steep portion of the SE flank adjacent to an extensive permanent fumarolic zone above a debris-avalanche deposit (figure 3; Neal and others, 1995; McGimsey and Wallace, 1999; McGimsey and others, 2004). On 15 May 2005, AVO seismologists noted a swarm of unusual seismic activity at Iliamna. The events were emergent and prolonged (the longest lasted 5-8 minutes) and were strongest at seismic station ILS, located on the S flank of South Twin (figure 4). The activity began at about 1250 UTC and tapered off at 1718 UTC. Analysis revealed that the signals most likely were caused by a surficial process, such as a snow avalanche (a common occurrence on Iliamna), but this particular event lacked the usual precursory seismicity preceding other Iliamna snow and ice avalanches ( Caplan-Auerbach and others, 2004; J. Caplan-Auerbach, written commun., 2005; Caplan-Auerbach and Huggel, 2007). Figure 4. Iliamna volcano topographic map showing the location of the 15 May 2005 rockslide as a thick black line on the S flank of South Twin and the seismic station ILS as a red dot. Lake Clark National Park boundary shown as a thin black line. Base map provided by C. Waythomas, AVO/USGS; courtesy of McGimsey (2008). During an overflight on 16 May 2005, Lee Fink of Lake Clark National Park observed a large, fresh rock slide (not a snow or ice avalanche) SE of Iliamna that began at ~1,980 m elevation on the SE flank of South Twin, and ran down to ~365 m elevation (figure 5a). Along the lengthy ridge extending S of Iliamna (including both South Twin, North Twin, and a large unnamed massif) are steep, exposed sections of bedrock. The 15 May rockfall occurred below the ridge (figure 5b). Figure 5. (a) Rock avalanche on SE flank of S Twin (topographic high at upper center) beginning at ~2 km elevation and running down to ~0.37 km elevation. Photo by Page Spencer, Lake Clark National Park, 16 May 2005. (b) Iliamna from the E captured on 12 July 2006. The arrows mark the location of the 15 May 2005 rock avalanche. Photo by Christinia Neal, AVO/USGS. Courtesy of McGimsey (2008). During Iliamna's mid-May 2005 rock slide, earthquakes at Augustine volcano, ~100 km SSW of Iliamna in the Cook Inlet, increased from 2 per day in April to 70 per day by the end of the year (McGimsey, 2008). However, no evidence exists that this increase disturbed Iliamna. Other factors such as temperature changes, ice and snow mass (and other conditions) would have contributed to the weakening of the summit material at Iliamna. According to AVO, earthquake numbers increased significantly between 2008-2009, but returned to near-normal levels in 2010 (table 1). Table 1. Numbers and types of earthquakes at Iliamna between 2008 and 2010. Key: VT, volcanic tremor; LF, low frequency; Mc, magnitude of completion (lowest magnitude detectable); and '--', not reported. Courtesy of AVO. Early 2012 elevated seismicity. AVO reported that during December 2011-February 2012, earthquake activity steadily increased. During the first week of March 2012, numerous earthquakes occurred that varied in number and magnitude. According to a press account (Alaskan Dispatch), on 8 March, a moderate M 4.1 earthquake struck the region. On 9 March, AVO increased the Alert Level to Advisory and the Aviation Color Code to Yellow. AVO reported that the increased activity was a significant change, but also noted that a similarly energetic episode of seismic unrest from September 1996 to February 1997 did not lead to an eruption. Between 9 March through at least 3 April 2012, seismicity remained above background levels. Satellite images acquired during 9-16 March showed a plume drifting 56 km downwind that was likely water vapor. An AVO report noted that long-lived fumaroles at the summit of Iliamna frequently produced visible plumes, but the current plume appeared to be more robust than usual. Scientists aboard an overflight on 17 March observed vigorous and plentiful fumaroles at the summit, consistent with elevated gas emissions. Gas measurements indicated that the volcano was emitting elevated levels of SO2 and CO2, consistent with a magmatic source. During the overflight, scientists did not observe obvious signs of recent rockfalls, such as large areas of newly exposed bedrock or unusual disturbance of the glacial ice. Some deformation of the ice at the headwall of the Red Glacier on the E side of the summit was observed, but it is not clear that this was related to the current volcanic unrest; glacier avalanching is common on this very steep area and was last seen in 2008. During 25-27 March, activity declined somewhat to just above background levels. When not obscured by clouds, satellite and web camera views showed nothing unusual. References. Caplan-Auerbach, J., Prejean, S.G., and Power, J.A., 2004, Seismic recordings of ice and debris avalanches of Iliamna Volcano (Alaska): Acta Vulcanologica, v. 16, n. 1-2, p. 9-20. 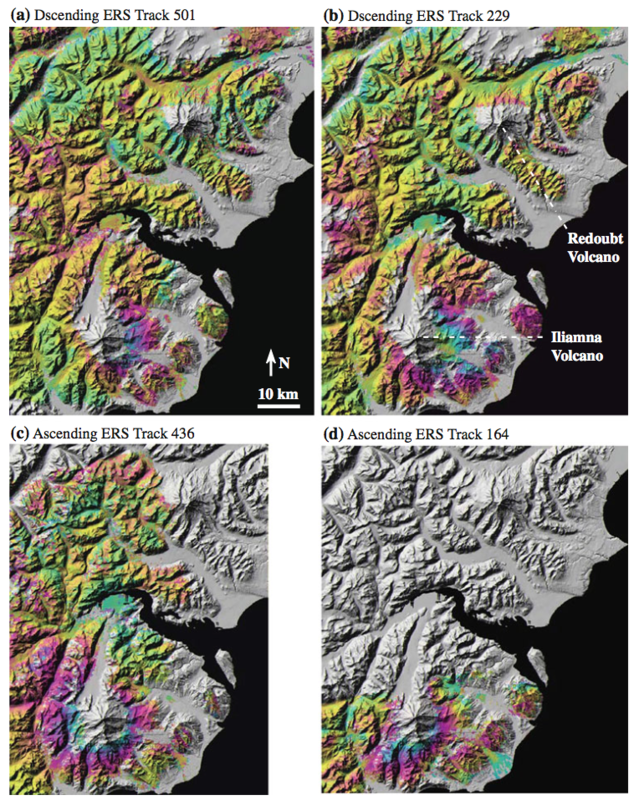 Caplan-Auerbach, J., and Huggel, C., 2007, Precursory seismicity associated with frequent, large ice avalanches on Iliamna volcano, Alaska, USA: Journal of Glaciology, v. 53, n. 180, p. 128-140. Detterman, R.L., and Hartsock, J.K., 1966, Geology of the Iniskin-Tuxedni region, Alaska: U.S. Geological Survey Professional Paper 512, 78 p.
McGimsey, R.G., and Wallace, K.L., 1999, 1997 volcanic activity in Alaska and Kamchatka: Summary of events and response of the Alaska Volcano Observatory: U.S. Geological Survey Open-File Report OF 99-0448, 42 p.
McGimsey, R.G., Neal, C.A., and Girina, O., 2004, 1999 Volcanic activity in Alaska and Kamchatka: Summary of events and response of the Alaska Volcano Observatory: U.S. Geological Survey Open-File Report OF 2004-1033, 49 p.
Neal, C.A., Doukas, M.P., and McGimsey, R.G., 1995, 1994 volcanic activity in Alaska-Summary of events and response of Alaska Volcano Observatory: U.S. Geological Survey Open-File Report OF 95-271, 18 p. [Iliamna, p. 4-5]. Waythomas, C.F. and Miller, T.P., 1999, Preliminary Volcano-Hazard Assessment for Iliamna Volcano, U.S. Geological Survey Open-File Report OF 99-373. Information Contacts: Alaska Volcano Observatory (AVO), a cooperative program of a) U.S. Geological Survey, 4200 University Drive, Anchorage, AK 99508-4667 USA (URL: http://www.avo.alaska.edu/), b) Geophysical Institute, University of Alaska, PO Box 757320, Fairbanks, AK 99775-7320, USA, and c) Alaska Division of Geological & Geophysical Surveys, 794 University Ave., Suite 200, Fairbanks, AK 99709, USA (URL: http://www.dggs.alaska.gov/); Alaskan Dispatch (URL: http://www.alaskadispatch.com/). AVO reported that during 24-30 October seismicity at Iliamna remained slightly elevated. Clear satellite and web camera views showed nothing unusual. The Alert Level remained at Advisory and the Aviation Color Code remained at Yellow. AVO reported that during 28 March-3 April seismicity at Iliamna remained above background levels, although just slightly, during 25-27 March. When not obscured by clouds, satellite and web camera views showed nothing unusual. The Alert Level remained at Advisory and the Aviation Color Code remained at Yellow. AVO reported that during 21-27 March seismicity at Iliamna remained above background levels, although just slightly during 25-27 March. When not obscured by clouds, satellite and web camera views showed nothing unusual. The Alert Level remained at Advisory and the Aviation Color Code remained at Yellow. AVO reported that during 9-20 March seismicity at Iliamna was above background levels. Satellite images acquired during 9-16 March showed a plume drifting 56 km downwind that was likely water vapor. The report noted that long-lived fumaroles at the summit of Iliamna frequently produced visible plumes, but the current plume appeared to be more robust than usual. Scientists aboard an overflight on 17 March observed vigorous and plentiful fumaroles at the summit, consistent with the elevated gas emissions. Gas measurements indicated that the volcano was emitting elevated levels of sulfur dioxide and carbon dioxide. The Alert Level remained at Advisory and the Aviation Color Code remained at Yellow. AVO reported that earthquake activity had steadily increased at Iliamna during the past three months. On 9 March AVO increased the Alert Level to Advisory and the Aviation Color Code to Yellow. The report noted that the current activity was characterized by numerous earthquakes that had varied in their number and magnitude over the past week. A brief steam emission began at about 1050 on 7 November. Puffs of steam, ejected every 1-5 minutes, rose an estimated 3 km above the summit. No ash was visible in the steam puffs. The activity ended at about 1330. Iliamna's last reported activity occurred 1952-53. A USGS seismic station 20 km NNE of Iliamna recorded no unusual seismicity. Information Contacts: J. Proffett, Anaconda Co., Anchorage; J. Kienle, Univ. of Alaska; J. Lahr, USGS, Menlo Park, CA. 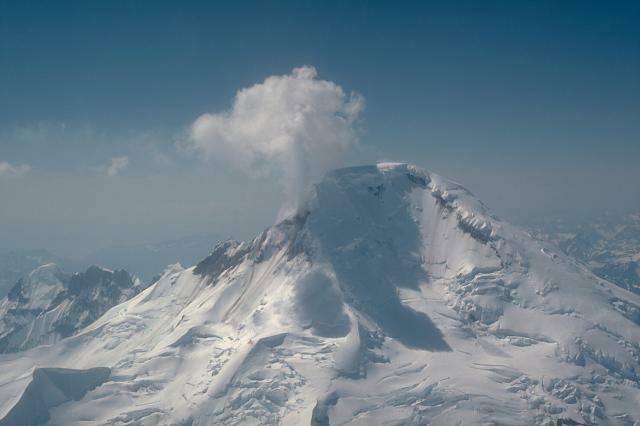 At 0800 on 19 March Reeve Aleutian Airways pilots Edward Livingston and Dale Schram observed a large steam plume rising about 1100 m above the summit. No ash appeared in the plume. Almost 3 hours later Northern Air Cargo pilot Wallace Niles observed a steam plume rising 1,000 m above the summit from a upper S flank vent. The plume drifted NNW. John Reeder noted that minor steam emissions are nearly continuous from Iliamna but a large steam plume is unusual. Seismicity began to increase on 1 August and persisted for the whole month. Several to 20 events of M 0.1-3.2 were recorded each day at depths from within the volcanic edifice to 9 km below sea level. All events seemed to be volcano-tectonic, and no long-period earthquakes or tremors that usually precede eruptions were observed. A similar but less intense cluster of earthquakes also occurred during mid-May of this year. AVO installed two additional seismic stations on the volcano in late August in order to increase the detection sensitivity and improve earthquake locations. Two flights were conducted in late August to measure volcanic gas emissions. SO2 flux was at the background rate of ~40 t/d. CO2, often indicative of magmatic degassing, was also detected. A small shallow earthquake swarm occurred beneath Iliamna during mid-May. After two months of ensuing quiescence, seismic activity increased on 1 August (BGVN 21:08). During September and the first half of October, 6 to 27 events were recorded each day at depths within the edifice to 9 km below sea level. Most of them were less than M 1.0 and the largest was M 3.2. All events seemed to be volcano-tectonic, and no long-period earthquakes or tremors that usually precede eruptions were detected. This seismicity was likely related to an intrusion of magma, but doest not mean that an eruption is imminent. Information Contacts: Alaska Volcano Observatory (AVO), a cooperative program of a) U.S. Geological Survey, 4200 University Drive, Anchorage, AK 99508-4667, USA (URL: http://www.avo.alaska.edu/), b) Geophysical Institute, University of Alaska, PO Box 757320, Fairbanks, AK 99775-7320, USA, and c) Alaska Division of Geological & Geophysical Surveys, 794 University Ave., Suite 200, Fairbanks, AK 99709, USA; NOAA/NESDIS Satellite Analysis Branch (SAB), Room 401, 5200 Auth Road, Camp Springs, MD 20746, USA. The seismic swarm that began on 1 August beneath Iliamna (BGVN 21:08 and 21:09) continued during 12 October-29 November at an average rate of 3-12 earthquakes/day. The swarm center is ~5 km S of the summit. All events (mostly M <1.0) were <10 km deep and seemed to be volcano-tectonic. No long-period earthquakes or tremors that usually precede eruptions were detected. This seismicity was likely related to an intrusion of magma, but does not mean that an eruption is imminent. The seismic swarm that began on 1 August (BGVN 21:08-21:10) continued during December and the first half of January. There were 2-16 earthquakes recorded each day. A seismic swarm that began on 1 August 1996 (BGVN 21:08) continued during late 1996 and into early January 1997 (BGVN 21:09, 21:10, and 21:12) with earthquakes occurring at a rate of 11/day. Activity began to decline during 11-17 January, when only two events/day were recorded. The swarm continued through 24 January at an average rate of less than one earthquake/day, a significant reduction from the rate two weeks earlier. Seismic activity through the end of February averaged 2-5 events/day. Earthquake counts decreased again during 1-7 March to a rate of 1/day, then decreased to only one locatable earthquake during the week of 15-21 March. By 28 March seismicity was reported to be at background levels. Iliamna is a deeply dissected stratovolcano 225 km SW of Anchorage in the Aleutian Range. The volcano is almost entirely covered with perennial snowfields and valley glaciers. A prominent fumarole field near the summit produces steam plumes that are commonly visible from Anchorage and the Kenai Peninsula on clear days. Iliamna is a prominent, 3053-m-high glacier-covered stratovolcano in Lake Clark National Park on the western side of Cook Inlet, about 225 km SW of Anchorage. Its flat-topped summit is flanked on the south, along a 5-km-long ridge, by the prominent North and South Twin Peaks, satellitic lava dome complexes. The Johnson Glacier dome complex lies on the NE flank. Steep headwalls on the southern and eastern flanks expose an inaccessible cross-section of the volcano. Major glaciers radiate from the summit, and valleys below the summit contain debris-avalanche and lahar deposits. Only a few major Holocene explosive eruptions have occurred from the deeply dissected volcano, which lacks a distinct crater. Most of the reports of historical eruptions may represent plumes from vigorous fumaroles east and SE of the summit, which are often mistaken for eruption columns (Miller et al., 1998). Eruptions producing pyroclastic flows have been dated at as recent as about 300 and 140 years ago (into the historical period), and elevated seismicity accompanying dike emplacement beneath the volcano was recorded in 1996. Huggel C, Caplan-Auerbach J, Waythomas C F, Wessels R L, 2007. Monitoring and modeling ice-rock avalanches from ice-capped volcanoes: a case study of frequent large avalanches of Iliamna volcano, Alaska. J. Volcanol. Geotherm. Res., 168: 114-136. Riehle J R, Waitt R B, Meyer C E, Calk L C, 1998. Age of formation of Kaguyak caldera, eastern Aleutian arc, Alaska, estimated by tephrochronology. In: Gray J E, Riehle J R (eds) Geologic studies in Alaska by the U.S. Geological Survey, 1996, US Geol Surv Prof Pap, 1595: 161-168. Roman D C, Power J A, Moran S C, Cashman K V, Doukas M P, Neal C A, Gerlach T M, 2004. Evidence for dike emplacement beneath Iliamna volcano, Alaska in 1996. J. Volcanol. Geotherm. Res., 130: 265-284. Waythomas C F, Miller T P, 1999. Preliminary volcano-hazard assessment for Iliamna volcano, Alaska. U S Geol Surv Open-File Rpt, 99-373: 1-31. Waythomas C F, Miller T P, Beget J E, 2000. Record of late Holocene debris avalanches and lahars at Iliamna volcano, Alaska. J. Volcanol. Geotherm. Res., 104: 97-130. Remarks: Deformation near Iliamna can be seen in averaged interferograms that span 1995 to 2000, though most of the deformation occurred during 1996-1997, coincident with a seismic swarm. There is no Emissions History data available for Iliamna. Iliamna volcano rises to 3053-m across Kamishak Bay, 75-km north of Augustine Island. The glacier-clad stratovolcano is extensively dissected. Many reports of historical eruptions may represent only large plumes produced by vigorous fumarolic activity. The rocky, arcuate ridges in the foreground are hummocks of a debris avalanche from the summit of Augustine in 1883 that reached the sea and extended the shoreline of the island by up to 2 km. The north face of 3053-m-high Iliamna Volcano, one of the Cook Inlet volcanoes monitored by the Alaska Volcano Observatory, is seen in this May 6, 1986 aerial view. Steam and volcanic gas rise from the nearly continuously active fumaroles high on the east and south flanks of the volcano. Occasional episodes of more intense steam emission have often been mistaken for eruptive activity at Iliamna by viewers across Cook Inlet. Photo by Game McGimsey, 1986 (U.S. Geological Survey, Alaska Volcano Observatory). 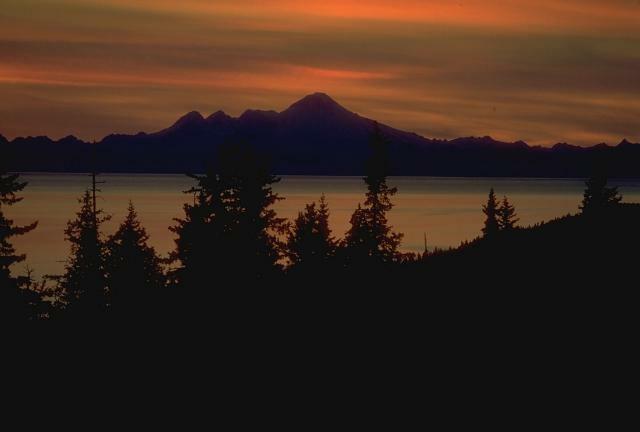 Iliamna volcano, seen here at sunset from the Kenai Peninsula, rises to 3053-m across Cook Inlet. 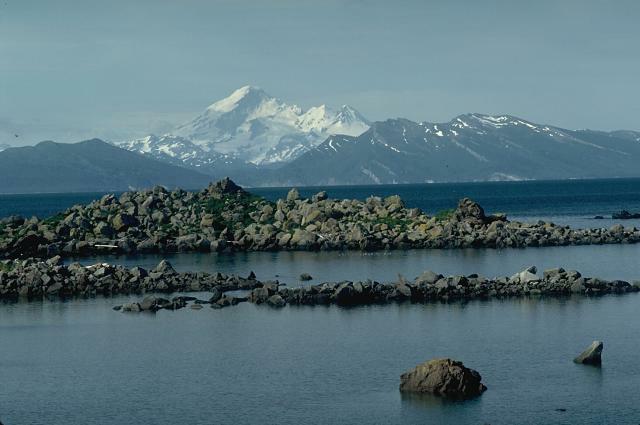 It is the southernmost of a chain of 3 large stratovolcanoes that rise to heights above 3000 m west of Cook Inlet. The eroded summit ridge of the volcano consists of 4 peaks along a 5-km-long ridge extending south (left) of the highest point. Photo by Alaska Volcano Observatory, U.S. Geological Survey. There are no samples for Iliamna in the Smithsonian's NMNH Department of Mineral Sciences Rock and Ore collection. Large Eruptions of Iliamna Information about large Quaternary eruptions (VEI >= 4) is cataloged in the Large Magnitude Explosive Volcanic Eruptions (LaMEVE) database of the Volcano Global Risk Identification and Analysis Project (VOGRIPA).